Poured into a goblet, a tight, white head forms above a bubbly golden body. A sweet, herbal aroma rises with just a touch of hops, boosting its subtle flavors of fruit, spice, and rum. A slight peppery bite gives way to a smooth dry finish. I was browsing around at Whole Foods one day, and I saw this bottle on the top shelf. I reached up, and grabbed it to take a closer look. It was 9% ABV and was only $5! I couldn’t believe it. I assumed this beer was horrible. But I am a huge fan of Brooklyn Brewery, and think they make one of the best barleywines around. So I grabbed it to find that it was on the list! So here we are… bottoms up, people! In the Glass: It looks like an unfiltered wheat in the glass. It’s almost orange, and there are a ton of little bubbles rushing to the top of the glass. When I poured it, there was a TON of head. So it’s hard to tell if there is much lace. But the head sticks around which excites me about the mouthfeel on this huge bottle of beer. Nose: It sort of smells like a farmhouse ale. The nose starts sweet, but then leads to a smooth bitterness. I am also picking up some citrus notes there… maybe some orange zest. Perhaps that is where the orange color comes from. Flavor: Whoa… where do I begin? There are several things going on here at once. Hold on, let me take another drink and try to walk you through the explosion on my tongue. First up, there is some dryness on the bottom half of the palate. Then the bubbles explode over your tongue until you swallow a dry and somewhat sweet finish. Then I sit there expecting for a sour aftertaste, but that never comes. It just settles in and quickly leaves me wanting more. For a beer with this much alcohol, you would never know it. There is no booze in the flavor of this beer. Mouthfeel: There is SO much going on here… it is like the bubbles are dancing across my palate from the second this beer hits my lips. The beer is thin, and the only time that I try to argue with myself is when the dryness kicks in. It is a gin dry too, not an Irish stout dry. This is a different, and an appreciated kind of dryness. Then as you swallow, the tongue is left refreshed and while still dry, not begging for anything but another sip. Aftertaste: There isn’t much aftertaste here. WIth what my mouth just went though, I am not sure I could handle an aftertaste. There isn’t much burp either. But the flavors in this beer are incredible. There are several beers in this series, and Brooklyn is known for making quality stuff… and this beer is no exception. I like it. I like it a LOT! 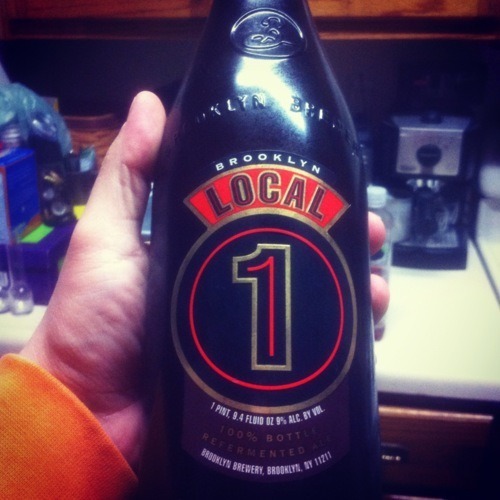 If you are looking for a good beer, with a high ABV, that is drinkable… this is it. It seems to be readily available and is cheap. I mean, $5… you can’t beat that with a stick. Pop the top on this bottle and let’s drink. Bottoms up, people! Second beer of the night. This one was a big bottle and has a lot of calories. Definitely not good for my diet. Oh well, I worked out earlier, so I’m ok, right? Hmm. This beer has a golden yellow color to it and looks really thick. It had a LOT of head, too. Like, when Ricky poured it into the glass, it immediately overflowed with foam out of the top of the glass and on to the counter. So yeah, a ton of head there. It looks like it has some floaties swimming around in it too. The beer smells, well, sour. Ricky will probably like this one. He has a thing for sour beers. They’re not my favorite. I can smell some lemon and spice in this beer. I’m not even sure what to expect out of the taste, but let’s find out. It’s a very rich flavor, and I was right, I can taste some lemon in there. It’s citrusy, but I wouldn’t call it a light sort of beer. It’s heavy, and flavorful. There is some tanginess in there. Not very carbonated at all, really. Mostly what I taste is the citrus. There’s a bit of an aftertaste, but I’m not even sure how to describe it. It kind of leaves your mouth feeling hot and spicy. I’m not really sure what to think of this beer. It’s good, but I’m not sure if it’s really my style. But, then, when I think about it, I think I’d probably drink it again. I like it because to me it doesn’t really fit into a typical beer mold… I’m not even sure what season you should drink it in! While the beer’s not my favorite, it is ok, and I think the fact that I would buy it again kicked it up a notch in my book. Not too shabby.